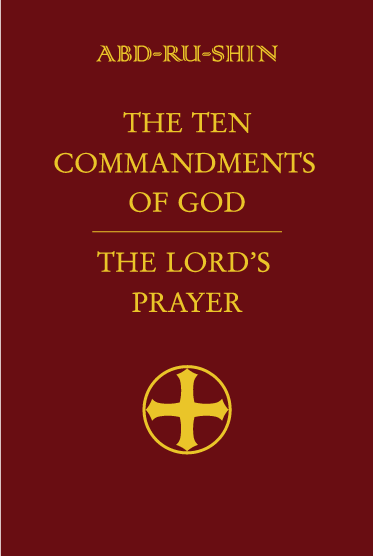 The book "The Ten Commandments of God and The Lord's Prayer - Explained to Mankind by Abd-ru-shin" was published for the first time in Autumn 1929. With his explanations based on the knowledge about the workings of the laws of creation – such as mediated by him in the Grail Message – Abd-ru-shin opens for humanity of the present time a new access to the understanding of these ancient writings, which in religious thought even today are still bestowed a deep significance. The attentive reader will recognise the concrete and immeasurable help these texts hold for him, provided that he makes the effort to recognise the intention for which they were given to mankind. "Who takes the trouble to experience a Commandment thoroughly with his intuition. When one sees how thoughtlessly children and adults habitually treat the Commandments of their God, every serious-minded person could and should be horrified. The Commandments are learned and superficially discussed at school. A person is happy if he has taken in the words, and can to some extent give answers concerning them, so long as there is any danger of his being questioned about them. When he leaves school to enter public life these words too are soon forgotten, and with them also the meaning. The best proof of the fact that he was not really interested at all in what his Lord and God demands of him. But He does not even demand anything, but gives in love to all men what they really need! From the Light it was indeed perceived how far human beings were going astray. So, like a teacher, God faithfully showed them the way that leads them to Eternal Life in the Luminous Realm of the Spirit, thus to their happiness. Whereas disobedience must lead to misery and ruin for mankind! Just for that reason it is not really correct to speak of Commandments. Rather they are very well-meant advice, pointing out the right way through the World of Matter, with which the human spirits themselves wished to become acquainted. "You see that all the Commandments are only the best friends for men, to protect them faithfully from evil and from suffering! Therefore love them and respect them as a treasure, the guarding of which brings you only joy! –"